High rise would have hundreds of flats for rent in Woking town centre. 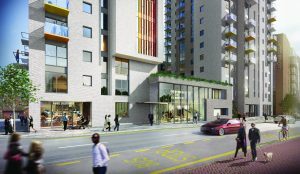 Another part of Woking town centre could soon be reaching for the sky, with 241 flats for rent in a new tower block development. With several tall buildings already dominating the western part of the town and others under way or planned, developers are targeting the eastern section for what they say is an innovative high rise. U+I Group (name is pronounced U and I) has applied to replace the ‘unloved’ 1980s Elizabeth House office block in Duke Street with a six-to-20 -storey building of flats, offices and shops. The good news for home-seekers is that the 241 mainly one-bedroom flats would be ‘build to rent’, which the company says is a new model for renting. A computer-generated image of how the new development on the Elizabeth House site would look. Elizabeth House is currently a four-storey block said to have a high vacancy rate. Its offices are advertised for rent by Regus, which provides short and long-term flexible workspaces. U+I Group, based in London’s Westminster, says it ‘transforms areas of towns and cities into thriving communities and neighbourhoods’. The company bought Elizabeth House and the linked Cornerstone office block for £6.55 million in March 2011. It put in a full planning application to redevelop Elizabeth House on 31 August this year. tenancies and simple, all-inclusive monthly rents. “We would like to replace the tired and unloved Elizabeth House with high-quality rental apartments which have beautiful new outside spaces, creating a place which people will call home,” the spokesman added. The development would include 532 square metres of commercial floor space for either offices, shops, restaurants or start-up businesses. There would also be landscaped communal spaces, basement parking and 24-hour on-site maintenance and management.